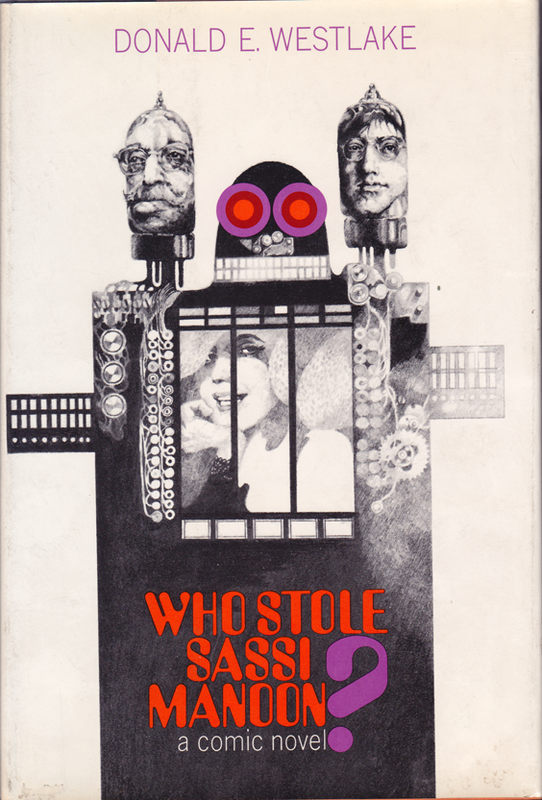 Review: Who Stole Sassi Manoon? Donald E. Westlake: It’s difficult to be truly whimsical without being arch. I can’t do it. Donald E. Westlake: He couldn’t do it, either. That’s a minority opinion, of course. The older the guest the closer to the front door he was likely to stay. The main living room, off the entrance, was full of the cigar smokers, the businessmen, the money boys; words like probate and percentage thudded off the white walls and buried themselves in the purple carpet. Some wives were there, too; fat-armed women expensively but uselessly dressed, sitting in a cluster like a display of joke dolls in a novelty shop, talking to one another about the quality of service in this hotel, that hotel, all over the uncivilized world. Amid them sat Miss Rushby, blending with the group like a submarine in a school of whales. Deeper in the house, in what was called the library because it was full of books bought en masse at an auction, where[sic] the pipe smokers, the intellectuals, the established writers and directors, and here and there a creative producer, telling each other how crappy their agents were. The wives here tended toward straight hair and plain talk; some of them hadn’t seen each other since the last march on Washington. In a corner, Major ffork-Linton was involved with five others in a game of liar’s poker, and seemed to be so far the only winner. Beyond the library, in what was called the solarium because it leaned heavily to windows and plants, were clustered the cigarette smokers, the pros, the actors and singers and comedians and personalities and celebrities, telling each other what great book jackets they’d read recently. Here the wives looked like audition day at the Copa–leggy, expensive, blank-faced. Benny Bernard, trying to do himself a little good, was looking around for a conversation to join. Out by the pool were the pot smokers, the young hippies, the twenty to twenty-five crowd, the new breed–TV series regulars, rock group members, actors who were feeling guilty about copping out on La Mama because they were too young to have copped out on Circle in the Square and too old to have copped out on Yale. Nobody was married out here, or at least not very married, and everybody had already slept with everybody else, so there was nothing to do but dance around the pool and talk to one another–shouting over the music–about analysis. Scattered through all the rooms, like the yeast in an upside-down cake, were the critics, the magazine writers, the freelance journalists and the book compiling aficionados who fill the chinks and crannies of every film festival worthy of the name. They were the only guests talking about movies, and they were doing so passionately, knowledgeably, and interminably. So I’m 469 words into a review without having written a word myself. And honestly, I don’t know what there is to say–this is, in my opinion, the worst novel Westlake ever wrote. And yet gaze upon that lengthy scene-setting passage I quoted above–magnificent, isn’t it? Did anybody ever sum up a showbiz party any better? That’s Who Stole Sassi Manoon? in a nutshell–a scattered assortment of precious gems in a setting of pure brass. And somewhat corroded brass at that. How did that happen? Westlake was developing a relationship with Hollywood–stands to reason, since it was buying up the film rights to his books on a regular basis. He obviously put out feelers via his agent to see if anybody wanted him to write an original screenplay, and Palomar Pictures hired him to do just that. The story he wrote was a comic take on a movie star’s kidnapping, which I suppose, in hindsight, might have been a bad idea–who are you going to get to play the star being kidnapped who is famous enough to sell tickets but will still see humor in the premise? So this is a book that was originally supposed to be a film, and that may be a big part of what’s wrong with it–though the same thing happened later on (with a movie that did get made), and the result was one of Westlake’s best books. Turning your own screenplay into a novel is apparently a skill that requires some time to master–Westlake never even tried to master the art of turning his novels into screenplays, and it’s debatable whether anyone ever mastered the art of translating Westlake into other mediums, but we’ve spent enough time on that subject already. This is, I think, his first novel dedicated to his second wife, Sandra Foley, who he married in 1967, just when he would have been writing it. “This, like me, is for Sandy.” In retrospect, perhaps not a good omen for that marriage? Westlake now has an ex-wife, two sons, and a new wife who will shortly give him two more sons, and he needs Hollywood’s filthy lucre very very badly, and any other form of income supplementation he can muster. He’d spent a lot of time and effort working on that screenplay, and he wasn’t going to let it go to waste. He’s also got a contract with Random House for a book a year under his own name, and for 1968, this was it. But in spite of some typically great writing, and some ideas he’d return to repeatedly in future, this doesn’t feel much like a Westlake. Yes, it involves a crime–and it’s meant to be funny. It is, in point of fact, his very first comic caper–a subgenre he justly came to be regarded as the supreme master of, but you’d never have guessed it from this. His previous comic crime novels had not been about heists–his nebbishe ‘nephews’ might be involved with organized crime sometimes, but they weren’t planning elaborate thefts. Not their department. 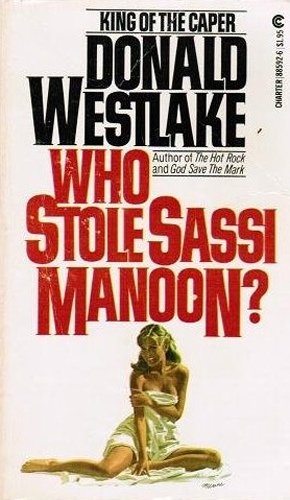 This isn’t a nephew book–this, like so many later Westlake novels, is the story of a heist gone ridiculously wrong, only the item being heisted is a person. Who ends up having the time of her life. We the readers should be so lucky. Hard to say what the film would have been like (I’m guessing not a classic; maybe something you’d watch on TCM at 3:00am in the morning because you couldn’t sleep, and it would cure your insomnia), but the novel is a satire of the film industry–and the parts of it that don’t involve dialogue or character development or plot are the best things about it. It opens with a quote from the dreaded Hays Code, about how “Law, natural or human, should not be ridiculed, nor shall sympathy be created for its violation”–well gee, if they followed that to the letter, Westlake would be right out of luck as far as Hollywood was concerned. Then there’s a fairly ingenious ersatz program for the Montego Bay Film Festival in Jamaica–there do seem to be a fair few film festivals held there in real life (maybe Westlake attended one? ), but this one is fictive in nature, and and so are most of the films on its schedule, full of ironic references to the idiosyncrasies of international filmmaking–such as The Boots of the Elk (Russian), The Beautiful Sewer (Polish), and Abortion, Italian Style (guess)–though the funniest recurring gag relates to a retrospective of films based on the comic strip Blondie, and all those film titles (like Blondie on a Budget, Blondie Goes Latin, and Blondie Meets the Boss) are quite painfully real. Would you believe they made 26 Blondie films between 1938 and 1950? All starring Penny Singleton. Now Debbie Harry I could see. But I digress. So that’s the short subject–on to the main feature–and its star, the closest thing this book has to a central protagonist, one Kelly Bram Nicholas IV, the black sheep of a wealthy family–okay, here’s another sticking point. Technically, Kelly isn’t rich now, but he was born rich, and raised rich, and we know by now what limited sympathy Westlake has for the moneyed classes–since Kelly has been disinherited by his rather appalling family, and is out to make his own fortune now, his creator will cut him a break (and toss him a cute redhead, but we’ll get to her in a minute). He still does not belong in the first, second, or possibly even the third tier of Westlake protagonists. I don’t think Westlake even for one second entertained thoughts of making this guy a series character. But he did invest Kelly with some of his own youthful personality quirks. Kelly loves science fiction, comic books, all that nerdy stuff; used to collect it, but he’s now cast childish things aside, and has become an inventor–of a computer that plans kidnappings. He calls it his Selective Timed Abstract Reactional Neutronic Abduction Positioner–Starnap for short. He keeps it onboard his 40 foot cabin cruiser, the Nothing Ventured IV (he got the money for all this by selling a few inventions and blackmailing his dad). At times, Starnap seems to be his only true friend–they play an African board game called Kalah quite frequently. According to Kelly, Starnap is “An adaptation of components from IBM, Burroughs, Control Data, ITT, RCA, and National Cash Register.” And with all this digital expertise, allowing him to create a computer compact enough to fit on a small boat, yet capable of performing calculations that successfully predict human behavior, he somehow thinks the best way for him to make a fortune of his own is to grab a movie star and hold her for ransom. Well, it’s the late 60’s–who knew? Kelly recruits two guys he knows to assist him in this grand endeavor. His former comic book supplier and fellow nerd, Frank Ashford, who is a talented impressionist–meaning he can do celebrity voices convincingly, not that he paints like Monet. And Kelly’s former prep school chum Robby Creswel, described as looking like Harry Belafonte’s younger brother–his parents are black professionals, very successful and respectable, but Robby always had a knack for getting into trouble, never did stick to the straight and narrow–I guess he’d be the white sheep of the family. Robby could have been a much better character with a bit more work–Westlake goes out of his way to tell us about his identity crisis–black, middle class, educated–not really at home anywhere. He has nothing in common with the black people in Jamaica, even though he was picked partly to blend in with them. He seems to mainly hang out with white guys his own age, but we’re told that he feels more comfortable in a gathering if there are other black people around. They still lived in another age, where all the people around them were white, and if a black skin did show up, it was a uniform for a servant. It confused them to have the servant sit down like anybody else. Robby thought sometimes he should feel compassion for people like that, locked into unreality, but he couldn’t quite get that objective. What he felt was irritation. They bugged him. It kind of bugs me we don’t get to see more of Robby, but at least he’s there, and not just as a prop. It feels different already, doesn’t it? These are movie characters, somehow, albeit not so very typical. Frank would be played by some rising comic with a talent for doing voices. Robby–well, the kidnappers are in their early 20’s, and the real Harry Belafonte was in his 40’s, but were they even going to make him black in the movie? A movie about a white woman getting kidnapped? I suspect Westlake did that on his own, after the movie project fizzled. I don’t really know who would have played Kelly, based on his description–tall, dark, gangly, intense, bespectacled–a young Jim Hutton? The actual Jim Hutton was probably a bit too old as well, but I don’t know who else could have pulled it off back then. And I note with some bemusement that he was born in Binghamton New York (a town Westlake knew very well), not quite a year after Westlake was born in Brooklyn. The identity conflicts that typically dominate a Westlake novel are so much on the down low here, Robby’s race issues aside, that you can barely make them out. Because Westlake can’t quite figure out how to sandwich them into this piece of work-for-hire (to put it politely) that he’ d churned out for a movie studio. Did he get behind on his obligations to Random House because he’d been working on this thing, and had no choice but to quickly repurpose it when the movie didn’t pan out? It’s not just that it started as a movie, though–Westlake is trying something quite different this time. This is his first comic novel written from the perspective of multiple characters, in the third person. Sometimes the narrator is gazing down omnisciently, commenting sardonically on the setting–sometimes he’s inside the head of this or that character, seeing things through his or her eyes–never sticking with any of them for very long. All Westlake’s previous comic novels were written in the first person from one character’s perspective, and have a certain confessional feeling to them–with the exception of The Busy Body, which is in the third person, but entirely from the protagonist’s POV–a bit more hard-boiled, but still extremely focused on one person. This new approach he’s trying here will increasingly be the standard approach for his comic novels, but he’s new at it, and the thing about letting each of your main characters be the center of attention is that you need a lot of good characters. He doesn’t really have any here. It’s a problem. Who else writes like this? Well, P.G. Wodehouse. That’s why I have that caricature of him up top. 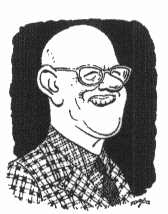 Wodehouse wrote quite often about comic kidnappings–quite often the abductee is a pig (good old Blandings Castle), but in two of his early books The Little Nugget and Piccadilly Jim, it’s a rich kid. Wodehouse is, of course, the ultimate master of this type of writing–got it down to a science. Here’s his opening for Piccadilly Jim–set in America, I should mention (Plum loved America and its citizenry, for all our many flaws–and we loved him back, for all of his). The residence of Mr. Peter Pett, the well-known financier, on Riverside Drive is one of the leading eyesores of that breezy and expensive boulevard. As you pass by in your limousine, or while enjoying ten cents worth of fresh air on top of a green omnibus, it jumps out and bites at you. Architects, confronted with it, reel and throw up their hands defensively, and even the lay observer has a sense of shock. The place resembles in almost equal proportions a cathedral, a suburban villa, a hotel and a Chinese pagoda. Many of its windows are of stained glass, and above the porch stand two terra-cotta lions, considerably more repulsive even than the complacent animals which guard New York’s Public Library. It is a house which is impossible to overlook: and it was probably for this reason that Mrs. Pett insisted on her husband buying it, for she was a woman who liked to be noticed. Compare this to the description Westlake wrote about the party, and you see he was studying The Master very closely–and finding out for himself how easy Wodehouse is to read, and how very difficult to emulate. He never liked to talk much about his debt to Wodehouse, but it’s unmistakable. Remember, Westlake worked for the Scott Meredith Literary Agency–which basically got its start representing Wodehouse. Remember something else–Wodehouse worked extensively in Hollywood, as well as on Broadway and Tin Pan Alley (his contribution to popular culture simply has no parallel, anywhere), and his books were constantly getting adapted into films–Piccadilly Jim alone has been made into three. That little comment I put up there, from a mock-interview of Westlake and several of his pseudonyms (written entirely by Westlake himself) that you can find in The Getaway Car, is Westlake indirectly admitting that debt. But for Westlake, of course, the problem was not how to write like P.G. Wodehouse–it was how to write as well as P.G. Wodehouse, while still remaining Donald E. Westlake. It’s fine for Wodehouse to be all whimsical and arch–that’s what he’s there for. But Westlake wants to be a bit more–for want of a better word–rugged. Wodehouse often wrote humorous fiction dealing with crime, but Westlake is writing crime fiction with a sense of humor, and he needs his own voice for that. He isn’t all the way there yet. One of my favorite non-series Wodehouse novels is Laughing Gas, set in Hollywood in the 1920’s–it has the premise that while under dental anesthesia, the protagonist and a bored American child star who just wants to have fun like a normal kid, switch bodies–yeah, you’ve heard this one before, haven’t you? But nobody had ever heard it before Wodehouse. Hollywood owes his estate like a trillion dollars, but never mind that now. Sassi Manoon, the titular character (who really has almost nothing to do in this book at all), is an adult female version of the bored child star. It’s the same idea–movie stars don’t really want to be movie stars. It just got foisted upon them. Now, that works if you’re talking about a child star, because c’mon–nobody asks for that. That’s what stage mothers are for. But just as certainly, nobody ever becomes a major film star as an adult without wanting it very badly, working, scheming, conniving, shouldering her way past other aspiring starlets. How did someone as apparently bereft of ambition as Sassi ever get to the top of the pile? And not only is Ms. Manoon a major film star, she’s supposedly ‘top box office in the world’, and it’s the late 1960’s–there was a time when nearly all the biggest stars were women, but by the late 60’s, those days are coming to an end–unless you could sing like Julie Andrews or Barbra Streisand, you were unlikely to be anywhere near the top of the box office charts–the exception, in 1967, was Elizabeth Taylor, who had, of course, started out as a child star. And who Westlake had written a very sympathetic biography of, years earlier, published under a pseudonym–I’ll review that sometime. So she’s a very nice person, not the tiniest bit stuck-up or neurotic, good sense of humor, and she’s got two beautiful Afghan hounds named Kama and Sutra, and is of course beautiful herself, and blonde, and there’s really nothing at all wrong with her, and all she wants is to live like a regular person and do her job, and still have a normal life. And I could imagine any number of movie stars identifying with that notion of themselves, and maybe that would have been the hook to lure one of them in to play her. If the movie had ever been made. But I don’t buy any of it. She didn’t start out as a child star–she left a sailor husband, before heading for Hollywood–she worked damn hard to get where she is, and the only person stopping her from walking away is herself (I mean, Grace Freakin’ Kelly walked away at the peak of her fame, though hardly to lead a normal life). Westlake will revisit this general scenario, jilted sailor husband and all, in a later work, and it will be a much darker portrait of celebrity. Followed still later by one of the darkest portraits of celebrity anybody ever wrote. Plus there was this series of detective novels–oh well, it’ll keep. I don’t want to synopsize this one to any great extent. The story is, by Westlake’s standards, pretty damned weak. They go to Jamaica–they scope out the terrain, following Starnap’s instructions. They grab Sassi while she’s screening a film entry (she’s there as one of the festival judges), only to learn they’ve actually grabbed Miss Rushby, companion to Major ffork-Linton (Westlake is letting his Wodehousian roots show here), and a fine pair of old school English felons they are, but not enough time to develop them, and they do stick out a bit in this context. It was the Major who stole Sassi (answering the question posed by the title), and they have to work out a deal, since he’s attached to Miss Rushby (she’s actually his wife and the mother of his son, who they have to ransom from some warlord, and it’s all just so tiresome having to explain it). They all end up on an island in Part 2 (entitled People, whereas Part 1 was Machines), and of course there’s romance and revelations, and misunderstandings, and schemes and counter-schemes, and it sounds so much more interesting than it actually is. And then there’s Jigger Jackson. Yes, Jigger. That’s a girl’s name. No, I have no idea, maybe she’s from the south? Redheaded, spunky, a whole lot sassier (and sexier) than Sassi, and trying her darndest to become a movie star. She has this idea maybe Ms. Manoon will want to help her, and through a series of events I don’t feel motivated to describe, she ends up getting abducted as well. For some reason, she’s attracted to Kelly–she’s got a weakness for schnooks, which is certainly convenient. But she’s determined to resist her feelings, because she has a destiny to fulfill–Miss Rushby puts her up to stealing the boat starter key from Kelly–then she and Kelly have what I must admit is a pretty touching love scene–also funny. And so very Wodehouse, I can’t even begin to tell you…..but with a Westlake-ian lilt to it. She blinked. She hadn’t expected anything like this from Kelly. All she’d ever seen from him so far was petulant schnookdom. This was the other side of the coin and she was finding it a contradictory but compelling combination: a schnook with fire. “That’s right! You do know, don’t you?” He swigged from his drink, thumped the glass down on the table. “She did. “Money!” she cried. “That’s right, Kelly, you’re right!” She was caught up in it completely now, she was clutching at his arm, she’d never felt so totally understood by another human being in her entire life. She’d forgotten all about her belief that Kelly was a schnook, she’d forgotten all about Miss Rushby and the key, she’d forgotten all about Sassi Manoon and the perfect entree into the movies. There was nothing but Kelly, who understood! He understood! “We’ve got to get it any way we can!” she yelled, exultant. “And then they’ll leave us alone!” Kelly roared. He was gripping her arm, his hands like steel. “To live our own lives!” she yelled in his face, laughing at the wonder of it, the beauty of it, this meeting of star-crossed atoms. They flung themselves into a wild embrace, and only much later did they start to be gentle. Cast Emma Stone as Jigger, and some guy who doesn’t make me sick to my stomach as Kelly, and I’d pay for a ticket. Well, maybe I’d just wait for it to pop up on cable. So can we just cut to the chase here? They get the ransom money. The Major and Miss Rushby try to swindle them out of it, with Jigger’s assistance (since Jigger still thinks Sassi can help her, and refuses to process that Sassi is delighted to be taking a vacation from her crazy life), but Jigger is torn between stardom and Kelly–and of course true love prevails. As it always does in this kind of story. Only in this case, true love prevailing means the kidnappers get away with the goods, and it’s all arranged in such a way as that you know the authorities will never remotely suspect them. They only get about 100k per man, so they’re hardly set for life–they just get a bit more time to figure out who they want to be when they grow up. Kelly gets Jigger, and Jigger gets Kelly (kind of think Kelly’s getting the better part of the bargain here). The Major and Miss Rushby get each other, though they are probably out a son (he sounds like a bit of a ne’er do well, anyway). Sassi gets to go back to her Afghans. And Westlake gets another check from Random House, after (one would hope) already getting one from Palomar Pictures. It’s a living. He also gets some ideas he can do more with later on. His next comic caper will leave nothing to be desired. He’s still a few years away from that, though. The best writers learn at least as much from their misfires as their successes, and Westlake is already one of the best writers out there. But even he can’t make a silk purse out of a bad screenplay–and it’s unlikely he deserves all the blame for that, since obviously the story he wrote would have been heavily influenced by the demands of his employers. He presumably got notes from the suits. Just so long as they came with bank notes, he wouldn’t complain too much–he’d just get even later on, by using that same story to bite the hand that fed him. The hand probably never even noticed. And that’s quite enough about Sassi–one of my shorter reviews–deservedly so (not that the quality of the book is really what determines how longwinded I get, from week to week). And my next review will be of a collection of short stories–some of them quite good, none of them really prime Westlake, because that simply wasn’t his form. And as far as publication goes, 1968 was not one of his better years. In terms of what he was actually writing during 1968, that’s another matter, but we’ll have to wait until 1969 (and 2015) to start seeing that. Well worth the wait. PS: In that lengthy quote up top, I added a bracketed [sic] because clearly the word preceding it is supposed to be ‘were’, not ‘where’. I don’t know if this is Westlake’s error or the publisher’s. And I don’t really care. I’m just relieved to have this one out of the way for good and all. Tagged as Hollywood, P.G. Wodehouse, Who Stole Sassi Manoon?